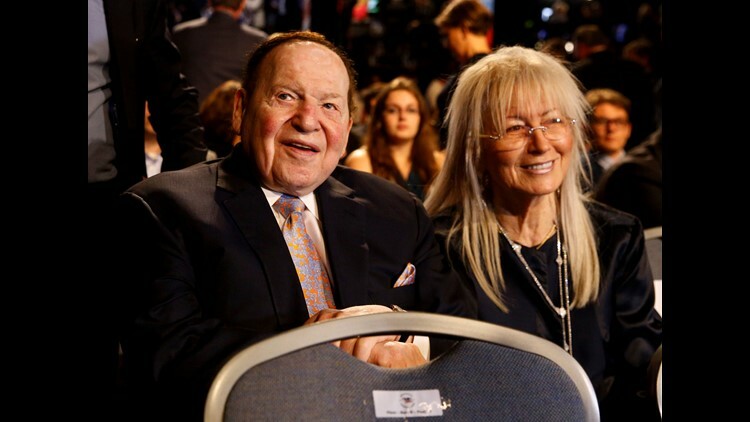 Chief Executive of Las Vegas Sands Corporation Sheldon Adelson sits with his wife Miriam waits for the presidential debate between Democratic presidential nominee Hillary Clinton and Republican presidential nominee Donald Trump at Hofstra University in Hempstead, N.Y. on Sept. 26, 2016. WASHINGTON – Super-wealthy donors escalated their political giving this spring, led by Republicans racing to protect their party’s hold on Congress in the Nov. 6 midterm elections, a USA TODAY analysis of newly filed campaign reports shows. Donors who have given $1 million or more in this cycle contributed $120.1 million to super PACs in the April-to-June fundraising quarter. That's more than twice the $58.8 million they donated during the previous three-month period. Republicans accounted for six out of 10 of the biggest super PAC donors in the second quarter. The biggest contributors: Las Vegas casino magnate Sheldon Adelson and his wife, Miriam, who gave a combined $30 million to the Congressional Leadership Fund, which is aligned with House Republican leaders. “Our donors are excited with the results that Congress has delivered and the thought of Nancy Pelosi becoming speaker next year is scary enough to keep them up at night,” said Corry Bliss, who runs the Congressional Leadership Fund. “That’s why our donors are giving money, and we are breaking every record,” he said. The group has raised more money than any other super PAC in the first 18 months of the election cycle, $93.5 million, and is on track to exceed its $100 million fundraising goal for the 2018 contests by month’s end, officials said. It’s using the money to establish dozens of field offices – 34 to date – to help protect vulnerable Republican incumbents and already has contacted more than 15 million voters in key races. Super PACs operate as fundraising committees that can raise and spend unlimited amounts of money to influence candidate races, although they are barred from coordinating their spending with candidates. Their fundraising offers a window into the activities of some of the biggest players in American politics. Big names opening their wallets to support super PACs: California billionaire Tom Steyer, who runs his own political operation to aid Democrats. 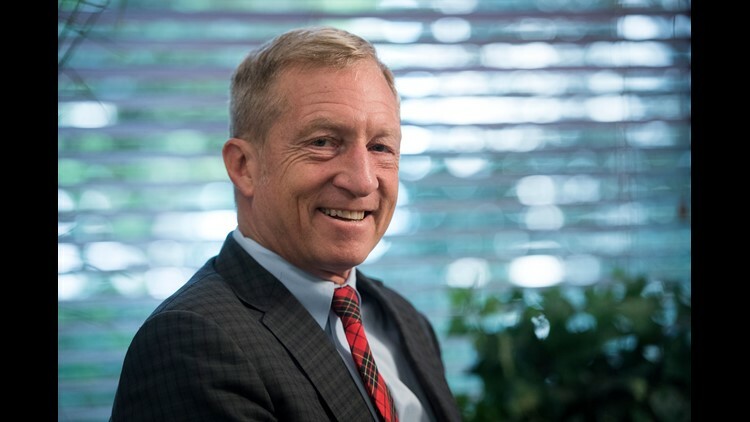 Tom Steyer, environmental activist and major donor to liberal causes. Steyer’s donations in the 2018 election now top $29.4 million – far exceeding the $10 million donated by one of the best-known figures in Democratic politics, the liberal financier and philanthropist George Soros. After the Adelsons, Wisconsin packaging magnate Richard Uihlein tops Republican donors, contributing more than $28 million. Of course, big money doesn’t always lead to success at the ballot box. Democrat Rep. Conor Lamb, for instance, won a special election in Pennsylvania this year, despite the more than $10 million spent to defeat him. And Democrat Hillary Clinton lost the White House to President Donald Trump in 2016, despite a nearly 2-to-1 fundraising advantage. This year, House Republicans face headwinds. The party of a first-term president usually loses congressional seats in midterm elections. To reclaim the House majority in November, Democrats need to flip just 23 seats now held by Republicans. The recent campaign filings with the Federal Election Commission offer signs of voter enthusiasm for Democratic House candidates hoping for a blue wave in November: In 17 of 19 “tossup” races where primary voters already have selected each party’s nominee, the Democratic nominee raised more money than the Republican during the most recent fundraising period, a USA TODAY tally shows. Republican incumbents, by and large, have more money stockpiled in bank accounts for the fall fight, however. And groups like the Congressional Leadership Fund plan their own advertising barrage to help those vulnerable lawmakers. “There will not be a single race in the country where we engage where a Republican will be outspent,” Bliss said.